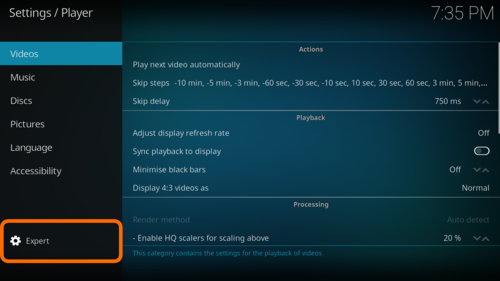 This section covers Kodi's various settings and where to find them. To access the System Settings menu, where you can access individual settings, select the System Settings icon (gear) at the top of the Menu on the Home screen. Choosing Settings from the Main Menu opens the Settings Window shown below. This is the current Settings screen for Kodi v18.x. 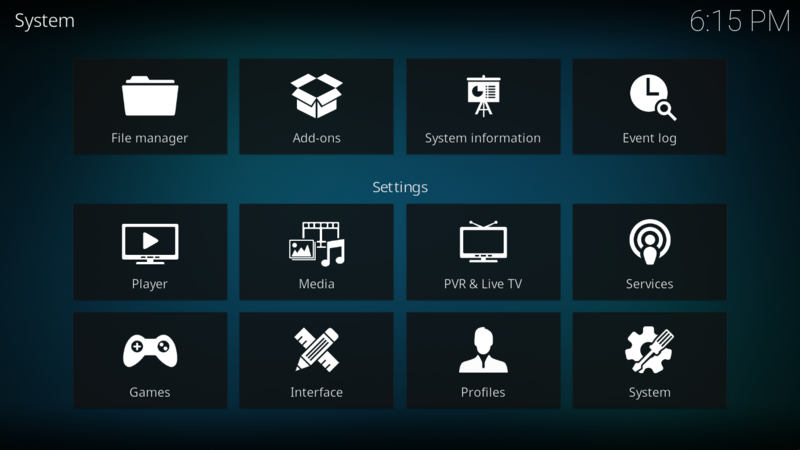 In this window, you are able to configure Kodi's options. The "Settings level" can be changed using the button in the bottom left which shows the currently selected level. The advancedsettings.xml file, which does not exist by default, can be created by a user in their userdata folder. This file is used for advanced settings and options that do not have GUI controls inside of Kodi. Some settings are experimental or very rarely set, so they can only be used via the advancedsettings.xml file. The file is simply a plain text file and can be edited by various text editors, so long as the name is "advancedsettings.xml". These advanced settings can be used to tweak various things such as episode naming patterns, special network ports, special behaviors, and more. This page was last edited on 12 January 2019, at 12:43.